Nothing can be more apt than the phrase “unity in diversity”, when one describes or pictures the Indian subcontinent. Adding its own streak of colour to the existing flamboyant and multi hued tapestry of Indian culture is the festival and one of the highly rated travel experience called Pushkar Camel Fair. Held each November at the time of the full moon in the Indian month of Kartik, Pushkar Camel Fair is a grand spectacular event, attracting 300,000 people and up to 50,000 camels. One of the largest camel fair in the world, the Pushkar Camel Fair witnesses the blending of tradition and spirituality. During this four day event, one gets to witness livestock trading, religious “pujas”, music, dance, various sports and competitions that are not just funny but unusually unique, shops selling local arts and crafts. It turns into an enchanting carnival that at times makes one feel like a moment from some fairy tale book. The festival comes to an end on the day of Kartik Purnima. On this day, ritual bathing on the ghats of Pushkar Lake begins at dawn. The water of the Lake is believed to possess medicinal powers and also wash away the sins of a lifetime. After the holy dip, the devotees visit the Brahma temple, which is one of the oldest and most prominent Brahma temples in the country. The first five days of the festival in Rajasthan are for selling and purchase of the cattle. 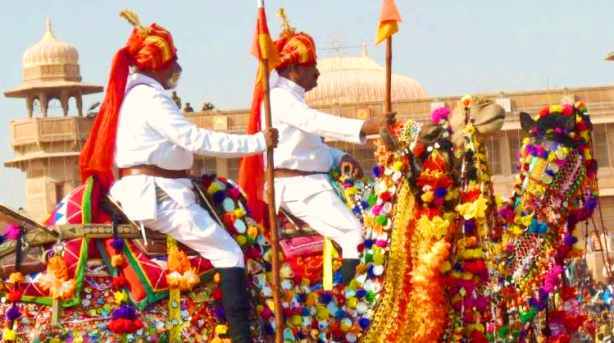 Over the years, this traditional affair has been revamped by the Rajasthan Tourism department to give it some additional glow and recognition. This event is a unique colourful display of another aspect of rural life in India, performance arts, handicrafts and an extravagant number of camels! The golden sands of Rajasthan will come alive again this November as millions will gather to witness this extravagant event. The multi hued attires of the ladies, the pristine white attire of the men, all adorned with rich and exotic ornaments mixed with the attires of the visitors present a unique scene to every visitor’s eyes. The beautiful merger of ethnicity and modernity sprinkled with the divine sound of holy chants and conches truly prove to be a never seen experience for one and all. So come November, treat yourself to this experience of a lifetime and soak in this enchanting spectacle called Pushkar Camel Fair. It is an unparalleled and unforgettable experience, capturing the vibrancy of Rajasthan and its people in all its grandeur.